Join me next Wednesday, March 20 for Good Morning Ward 3! Our guest speaker will be Micah Intermill, Budget Director for the City of Minneapolis. He will discuss how City staff build our budget every year, share how YOU can help shape the budget, and outline a proposal to shift from an annual to a biennial (two-year) budget. Wednesday, March 20 from 7:30 – 9:00 a.m. 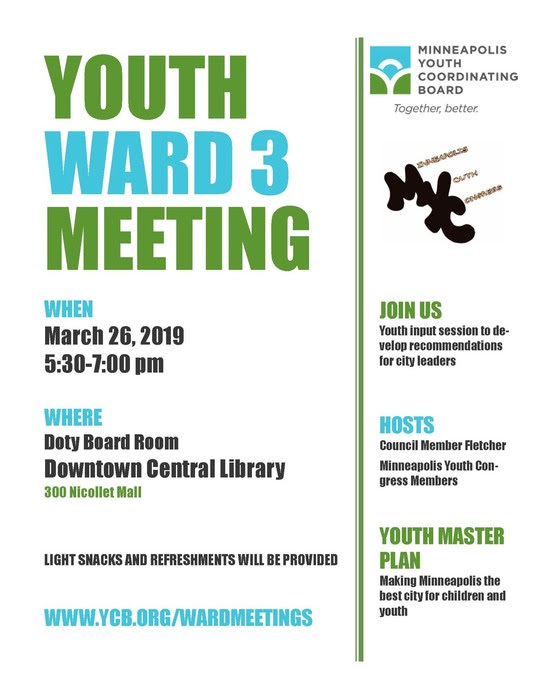 The Minneapolis Youth Congress and I are co-hosting a Ward 3 youth meeting on Tuesday, March 26 from 5:30 – 7:00 P.M. at the Downtown Central Library in the Doty Board Room to gather recommendations for the Youth Master Plan. This ward meeting is intended for a youth audience, and is a valuable opportunity for youth to share your ideas and experiences with local decision-makers and help shape the Youth Master Plan. More info on the Youth Master Plan available at www.ycb.org/youthmasterplan. The Youth Master Plan is an effort to mobilize an agenda on the behalf of youth and children in Minneapolis to the Youth Coordinating Board (YCB)’s board, which is made up of elected officials from the City of Minneapolis, Hennepin County, Minneapolis Public Schools, and the Minneapolis Park and Recreation Board. The Youth Master Plan will encourage collaboration across city, county, school, and parks systems and reflect the voices of youth in our city. For more information, visit www.ycb.org/wardmeetings. Council Member Fletcher holds regular open community office hours at 5:00 p.m., normally on Wednesdays, at a rotating neighborhood coffee shop in Ward 3 for constituents to drop by, ask questions, and raise any issues you see in the community. All are welcome! RSVP on Facebook or just show up. If you want to discuss a specific issue or project, email tony.aarts@minneapolismn.gov and we’ll add you to the agenda. Keep an eye on our Facebook Page for all the details on future scheduled events, or contact our office at 612-673-2203. Want to know what’s happening around Ward 3? Check out these event calendars! If you need a reasonable accommodation to fully participate or if you need information in an alternative format, please contact 311 (612-673-3000). TTY users call 612-673-2157.